Seesaw Fit is a panel found in the underground area of Bowser Castle in Mario & Luigi: Bowser's Inside Story. It is connected to a track on the room wall and functions like a seesaw. By using body slam on the panel, Bowser adds to its potential energy and it goes higher after a U-turn. 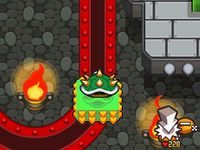 Doing this repeatedly allows Bowser to reach the higher areas of the room, including an exit to the west. This page was last edited on October 6, 2018, at 09:26.